You’ve seen them up in the sky your whole life. But did you know the Boeing 737 aircraft has been around for nearly 60 years? Were you aware that a 737 can be split into three generations: Original Series, Classics, and Next Generation? It took engineers three years to build the first ever 737. The Boeing 737-100 had its first flight in April of 1967 and officially went into service the following February. Lufthansa was the first airline to put this aircraft into their regular rotation. 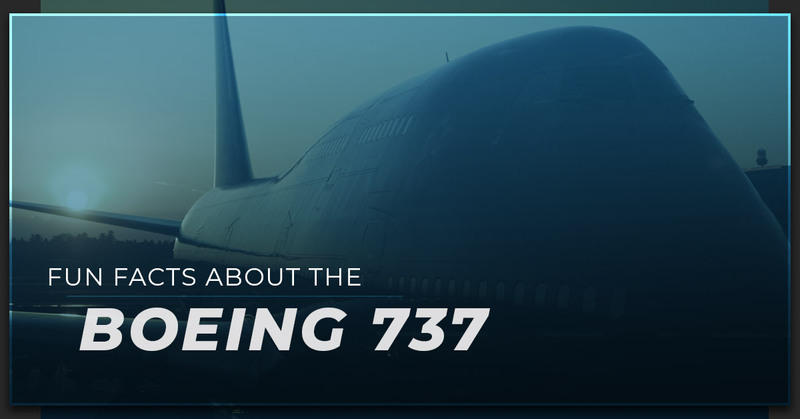 Though this may not seem like much of a surprise, the numbers associated with the 737 are pretty amazing. As of 2017, Boeing received more than 14,000 orders for the different types of the 737. Nearly 10,000 of those aircraft were delivered to customers while the remaining are nearing the delivery stage. The next time you fly, there’s a good chance you will be on a 737. That’s a lot of paint! Once it dries, the aircraft will weigh approximately 90,000 pounds. For comparison, that’s about as heavy as nine elephants. It’s virtually impossible to fathom that kind of distance. But you can think of it as equivalent to approximately 640 round trips from the earth to the sun. As the travel industry continues to gain steam, passengers will still rely heavily on the 737. This truly is an astonishing fact. As of 2017, World Bank confirmed a world population of 7.53 billion. So the fact that the 737 aircraft has carried more than double that number is mind-boggling. Have you ever been on a flight and wondered how many other planes were in the sky at that time? Well, on average, there are about 1,000 737 aircraft in the air at once. Not only does this statistic speak to the popularity of the 737, but also the importance of air traffic control and experienced pilots. In about the time it takes you to read this sentence, a 737 has either taken off or landed in some part of the world. This is yet another statistic that shows the importance of the aviation industry as a whole. It shouldn’t come as a surprise that travelers rely on the Boeing 737 more than any other aircraft. That equates to 77 miles high! As a reference point, the shortest distance between earth and space is about 62 miles. Unfortunately, we aren’t yet to the point where 737s can fly into outer space! Wondering what makes CFM 56 Turbofan engines so important? Well, because of their high bypass ratio and the fact that they burn much less fuel than a regular jet engine, they are the most common engines in commercial aviation today. When your business is building commercial aircraft, it only makes sense to have a huge manufacturing space. It’s safe to say the Boeing factory dwarfs what most people would consider large buildings. For those wondering, this factory has a volume of 472 million cubic feet. Now that you know a bit more about 737s, have you ever thought about flying one someday? All you really need to get started is experience as a private pilot. From there, the flight training instructors at Alliance Aviation will take you through the program that makes the most sense for you. It’s time to take flight with your career! Enroll in type rating training at Alliance Aviation today.